PDFOptim by RootRise Technologies Pvt. 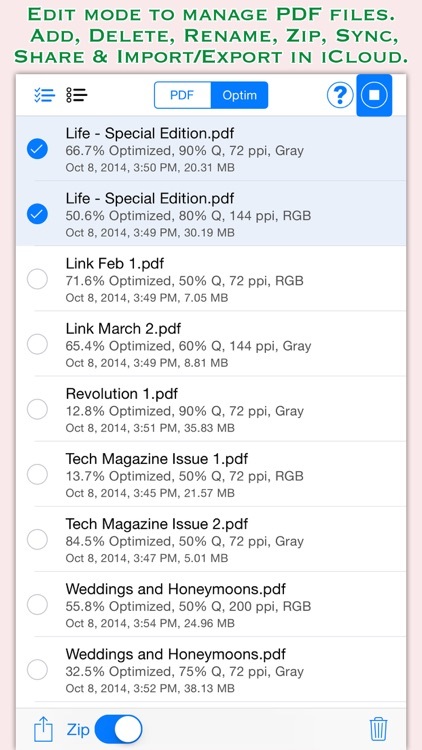 Ltd.
PDFOptim is a simple and intuitive way to compress, optimize and reduce PDF documents on iPhones and iPads. PDFOptim provides easy and effective ways to compress large image heavy PDF files. Inbuilt side-by-side preview to compare original and optimized PDF. Compressed PDF documents requires less disk space for storage and faster uploads and downloads saves transmission time and cost. The PDFOptim gives you access to compression options to help you to reduce PDF file size without compromising the document's integrity. 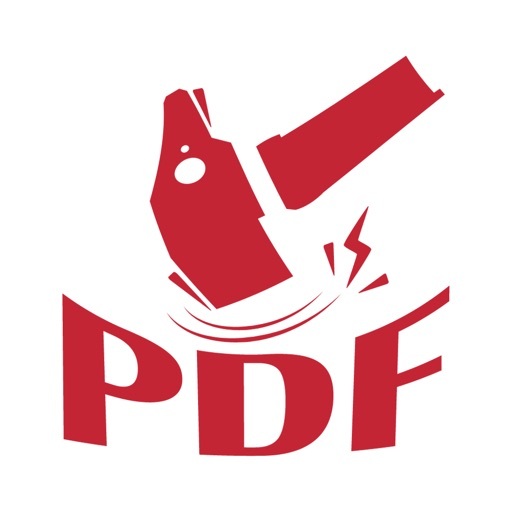 PDFOptim rewrites the entire PDF documents using selected compression options as efficiently as possible. Some PDF documents might not get compressed, because the PDF documents might be already compressed or have nothing much to compress. If your PDF documents are in another app (For Example Mail, DropBox or SkyDrive etc.) that uses the Open In… button, tap the button to open the PDF document in PDFOptim. 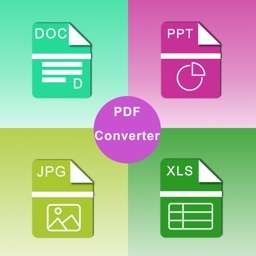 You can also transfer PDF documents from your desktop computer via iTunes into PDFOptim application on your iPhone or iPad. ◆ PDF optimization options to set from JPEG Image Quality, Image Resolution and Image Color Model. ◆ JPEG quality control. Set quality from lossless to least for resampling all raster images into PDF. It allows you to control optimized PDF size and viewing quality. 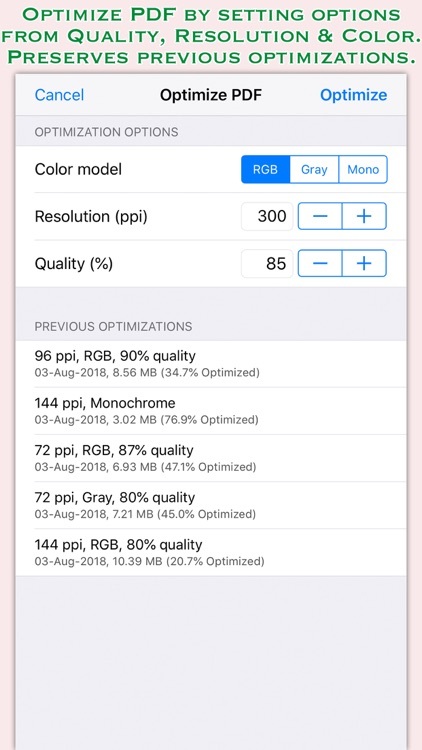 ◆ Image resolution ppi (pixels/inch) control to resize raster image contents. Downsampling at lower resolution decrease the file size dramatically. ◆ Image color model to choose from RGB, Gray and Mono. Selecting Monochrome color model compression option converts raster PDF contents into black and white which helps reduces PDF file size to greater extent. It is very helpful when compressing scanned books mainly containing text. Optimizing PDF using Monochrome color model can create 24 times smaller PDF compared to RGB color model compression. 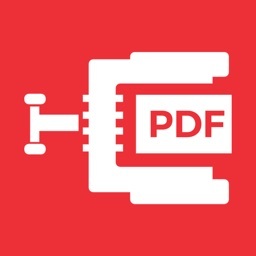 ◆ Password protected PDF documents supported for optimization using correct password. ◆ Optimized single or multiple PDFs can be shared as single ZIP (*.zip) file. 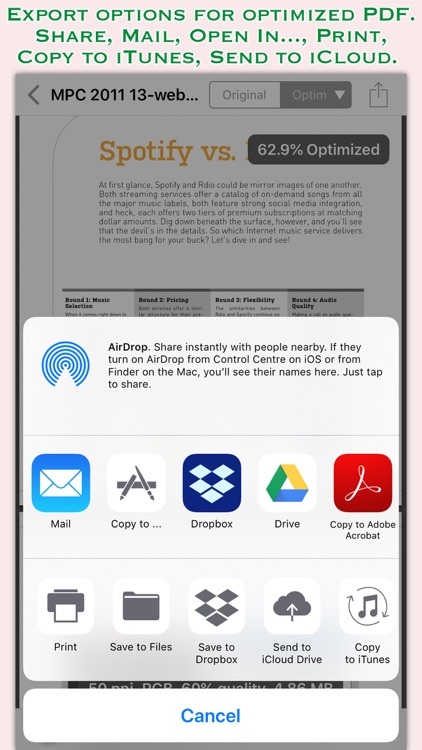 ◆ Allows Optimized PDFs to Open In… another application, Mail, Message, Print, share PDFs to nearby iOS devices via AirDrop. ◆ Use Copy to iTunes to save and share optimized PDFs on your desktop computer. 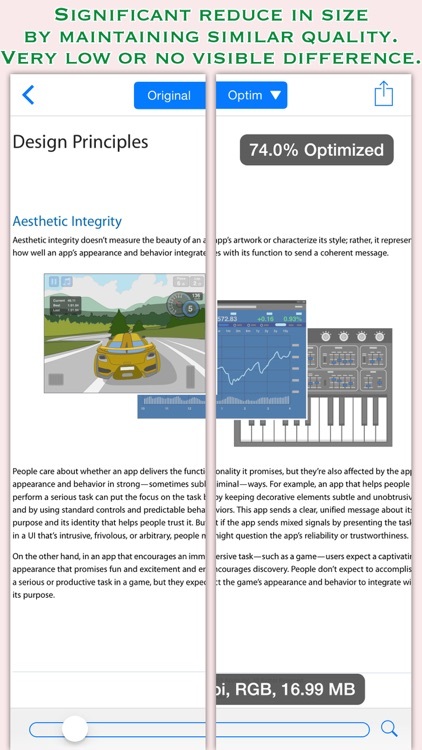 ◆ Real time preview of original PDF and optimized PDF. It helps you to compare optimized PDF integrity and quality side-by-side. Synchronized scrolling and zooming controls for both preview showing file size and reduced percentage information. (Only for iPad). ◆ Inbuilt PDF viewer with fully selectable and searchable text contents. Select and copy text to clipboard for further use. ◆ Pinch out and Pinch in to ZoomIn and ZoomOut view. ◆ Built in search feature to find a character, word or sentence any where in the PDF document. ◆ Scroll through your document by page slider or Go to page feature. 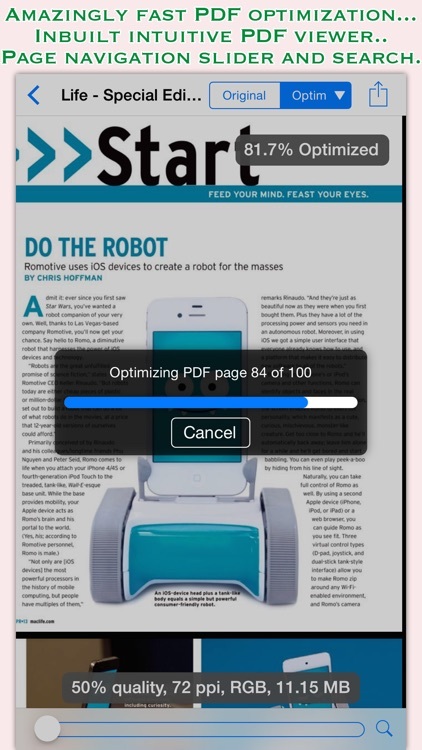 Note: PDFOptim is standalone application running natively to optimized PDF documents securely on your iOS device.